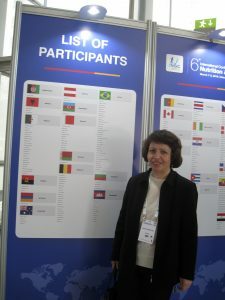 VALENCIA, Spain – Dr. Anahit Demirchyan, MD, (MPH ’99), Senior Researcher at the Avedisian Onanian Center for Health Services Research and Development, American University of Armenia (AUA) Turpanjian School of Public Health (SPH), had the opportunity to present her work at the 6th International Conference on Nutrition and Growth that took place in Valencia, Spain, on March 7-9, 2019. Her participation in the conference was made possible through the AUA Professional Development Grant Award. The conference hosted nearly 1,700 participants from 92 countries. Dr. Demirchyan was the only representative from Armenia. She presented her qualitative research on barriers to optimal breastfeeding practices in Armenia as an e-poster, which was open to participants during the whole conference. The research raised significant interest among the conference participants. The conference provided new insights on nutrition practices during pregnancy and infancy, its relation to child’s adiposity later-on, optimal nutritional solutions for very low birth weight neonates and for those infants with different digestive disorders and gut microbiota modifications. The presented new findings on the relation of infant’s nutrition and environment with his/her gut microbiota and long-term physical and neurocognitive development opened new prospects for further research.